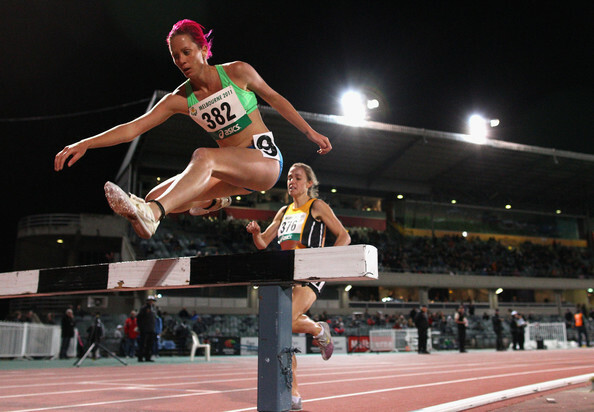 Athletics Exclusive spoke with Multiple Australian Representative and NCAA Champion in the Steeplechase Victoria Mitchell to get her thoughts on running the Womens Zatopek 10 at Lakeside on Thursday night. Athletics Exclusive – Hi Vicki, thanks for talking to us. I take it that you’re in Melbourne putting the finishing touches on your preparation for the 10,000m tomorrow night? Victoria Mitchell – Actually I’m still up in Sydney, I don’t fly down until tomorrow morning. Athletics Exclusive – Really! That seems like a really short turnaround for things, does that concern you? Victoria Mitchell – Na..not really. Athletics Exclusive – So Vicki we in the T&F game know you as that quirky, out there steeplechaser. WHAT are you doing running 25 laps around a track? Also you’ve won just about every fun run in Sydney this year and even ran a half marathon in San Francisco, what is going on? Victoria Mitchell – (laughs) I know, I did run a half in SF, I was going over there as a holiday not planning to run it but I ended up doing so and found that I was able to cover the distance fine. My coach Sean Williams said to me “I think you should enter the Zatopek this year” and I was like “Really? I don’t know” but he pointed out to me how I had done really well with a lot of road races over the same distance this year and said I would be a chance of a really good result this year. It also meant that I would have to increase the intensity of my sessions. Athletics Exclusive – When you say “increase the intensity of your sessions” do you mean in volume or intensity or both. Victoria Mitchell – In volume basically, a few extra reps. Athletics Exclusive – Was a chance of a National title a carrot? Victoria Mitchell – I’d be thrilled if I won! But really I’m out there to give my best and run 33min pace or high 32mins. Also if I qualified for Comm Games through it, it would take off some of the pressure of having to qualify in the steeple. Athletics Exclusive – You’ve pre-empted my next question there Vic, which was going to be if you did qualify for the 10,000m in Glasgow next year would you take your place at the start line? Victoria Mitchell – No, I don’t see myself doubling, I would prefer to take my place at the start line of the Steeple but I guess I will cross that bridge when I come to it. Athletics Exclusive – We know that your big goal is Rio in 2016, is that still competing in the steeple? Victoria Mitchell – Yes it is. Athletics Exclusive – But here’s the scenario… What if Victoria Mitchell over the next few months discovers that there is a hidden talent for the longer distances in her? Do you focus on more 5k & 10k then? Victoria Mitchell – (laughs) Well in that case I would probably run 5 before 10 but I dunno, If I found that was where my talent lay, I would have to get around the mental side of so many laps around the track and really be able to focus right through the race. But I prefer the shorter distances, I only run around 80kms/week. I’m not really a high mileage runner. Athletics Exclusive – Stepping away from talking running for a bit, let’s talk fashion. Can we expect a different style from you this race or are you going with the true and the tested? Victoria Mitchell – Well I’ve just signed with Nike in terms of what I’ll be wearing. With my hair, it’s back to blonde in a short Mohawk type. I was toying with dying it pink again but I’ve decided to save that for a major championship like Commonwealth Games. I used to have it darker on the sides but its all light now. Athletics Exclusive – Guess we’ll call it a Light Blonde Miley. Athletics Exclusive – Vicki, thanks so much for your time today, we want to wish you all the best for what I believe is your debut on the track for this distance. Athletics Exclusive – Vic, we think you’re not going to make that same mistake tomorrow night and your 2nd go at the distance is going to work out so much better for you. All the best once again! Renzo would have been one of the all time greats if his actual talent and aptitude for running matched his passion and love for the sport. So he decided to do the next best thing and write about the greatest sport in the world. His favourite saying is "you can take the runner out of running, but you can't take the running out of the runner"